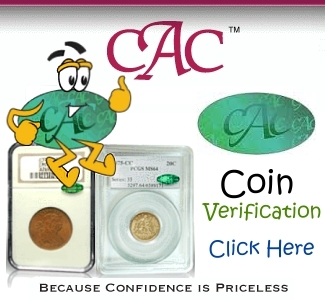 The 2-euro coin is a bimetallic coin composed of a nickel-brass center with a copper-nickel outer ring. Along with the 1-euro coin, the 2-euro coin forms the backbone of eurozone coinage. The 1-euro and 2-euro coins are similarly bimetallic, except that the inner and outer core compositions are reversed on the 1-euro coin so as to make the coins easily distinguishable from one another. The 2-euro coin is slightly smaller in size and slightly lighter than the 50-euro cent coin. 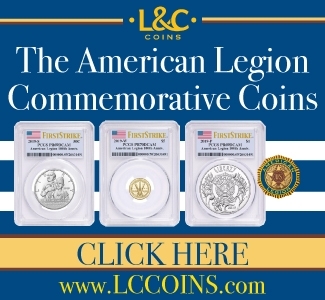 In relation to the size of U.S. coinage, the 2-euro coin is slightly larger and thicker than the U.S. quarter dollar. 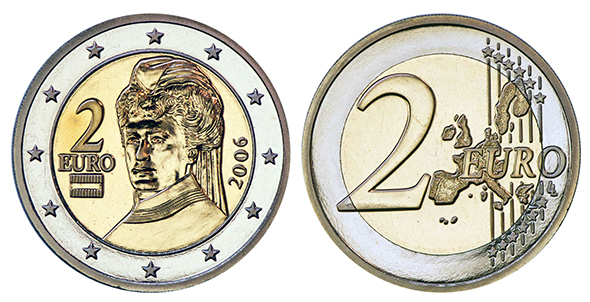 The 2-euro coin has an approximate value of $2.25 USD. Nickel brass center features the left facing bust of Bertha von Suttner with head facing forward at a 3/4 angle. To the left of Bertha von Suttner’s head a large numeral “2” surmounts the word EURO. Austrian flag below. The date wraps around the inner rim, to the right of Bertha von Suttner’s shoulder. Copper-nickel outer ring. Stars representing each of the original 12 member states of the Eurozone circle the perimeter of the coin and are bordered by a raised outer rim. Type 1: To the right, six horizontal line segments containing stars at each end. Individualized representations of the 12 original Eurozone states, centered and dividing the stripes. Large numeral “1”, centered on the left, to the right: the inscription EURO, all italicized. The designer’s initials “LL” appear below the O on the outer nickel-brass outer ring. Design encircled by a raised rim. Type 2: Same as Type 1, except, instead of the individualized representations of the 12 original Eurozone states, centered and dividing the stripes, a full representation of Western Europe, centered and dividing the stripes. 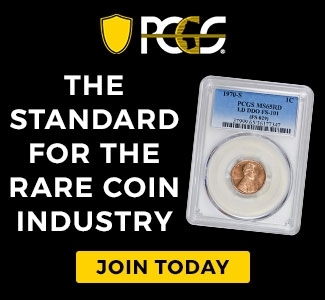 The Austrian Mint strikes the two euro coin in three unique finishes: a business strike intended for general circulation; a satin finish specimen strike produced for collector sets; and proofs, which are sold in annual proof sets. For the years 2005, 2007, 2009, and 2012, the Austrian Mint struck 2 Euro coins with commemorative national sides. The two euro coin pictured does not have Maria Theresa on it…. Good eyes. You are correct we made a typo error in the second sentence of the design description by mentioning Maria Theresa. The description has been corrected! Thank you for bringing that to our attention!